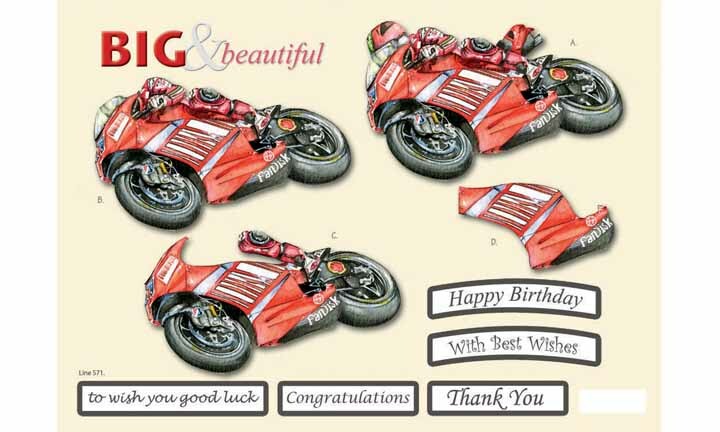 Big & Beautiful -Red Motorcycle Big and Beautiful Precut prints are single large 3D images. Easy to assemble, simply press out and layer the pieces following the step by step numbering, using 3D glue or foam tabs. Each sheet has 5 Precut captions and a matching backing sheet to use to create that special card. Big and Beautiful 3D prints are perfect for larger cards and scrapbook pages.